The background story is that I needed a basic version of it in a client project, so while I had dusted it off, I took some extra time of my own to rewrite it and specialize it for jQuery, as well as working out some kinks it had. Any number of slideshows in the same page. Nice CSS-based presentation features, like dimming out the background (Lightbox-like), autoplay, linking chosen images to another web page at click, thumbnail charts etc. Correctly waiting for images to load before display time is being started. Possible to customize errors if an image fails to load. Here are some basic instructions, taken from the PictureSlides implementation page.to help you get started (in the implementations page, you will also find all available settings). Create a web page where you put all the HTML that you want to use. 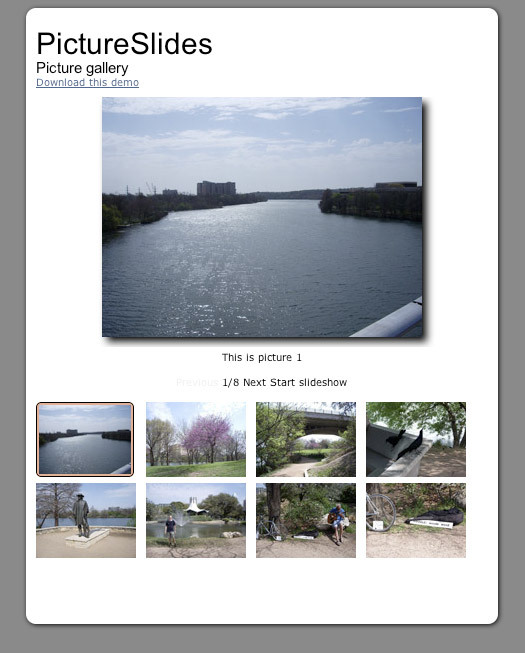 This is example HTML prepared for being used with PictureSlides. NOTE! Each slideshow has to be surrounded with an element with the class picture-slides-container. text : "This is picture 1"
And of course you are right, it was just an old copy and paste error – fixed now! I might be wrong, but the "jQuery plugin" version seems to have lost the possibility of filtering images with tags, using for example checkboxes. That is correct. In the transition from JAS to PictureSlides, the support for tagging was removed. Hello I would like to use this script but I can not wrap the text in the caption of the photo. In practice, the parameter named “text” of the array “Images”. I have tried using “\ n” or by entering the tag “” but I think the script to do a replace on the string. The character \n will never generate a line break in an HTML page. Maybe you can add HTML there and a <br> element, or just make sure in the CSS for the element that presents the caption that it wraps. Thanks but I could not explain. I tried to use the HTML tag “BR” but is mistaken as a string and print the page inside the div class = “picture-slides-image-text”. Is there a solution to replace the inside of Jquery? Is there a solution to capture the “Descriptive text” in the div “picture-slides-image-text and format it at will? This is exactly what I have been looking for. Thank you so much for posting this! I am sort of new to coding so I was wondering if there is a way for the title and the back and next buttons to be inline? Is there any way to make the title and the back and next buttons inline? I keep breaking it. I reviewed the code and I don’t see any difference between the first 2 images and the rest of them. What’s causing them to jump? It is because the border rendered outside the thumbnail. To make sure to avoid that, add a transparent border to all thumbnails, i.e. border: 1px solid transparent. Thanks so much Robert. Things are working now.